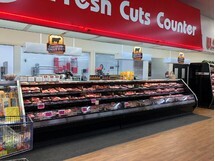 Lou's meat department features a wide selection of beef, pork and chicken that will meet your family's needs. Our meat is cut daily guaranteeing the freshest selection you can find. Also, we can customize any item just the way you like it. Whether you want your steaks cut a little thicker or would like to order a large quantity, your wish is our command. You can even call ahead and we'll have it ready for you. Can't find what you are looking for? Our knowable staff is ready to answer any questions you may have. Stop by today to explore our meat selection.